On March 25th, the Church celebrates the Solemnity of the Annunciation: an important moment for us to pause to recall what suddenly happened in the history of mankind, so that man could be changed profoundly and saved. In order to honor the Annunciation all throughout the year, the Church has given the faithful the Angelus prayer, the name of which is derived from the first word of its Latin form. 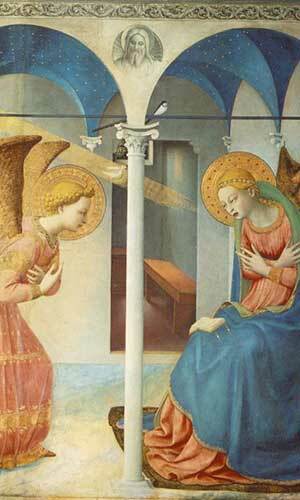 To say it is to replay the drama of the Annunciation once more, placing it vividly before our eyes and within our hearts. The Angelus as we know it sprung organically from an even more ancient tradition. The practice of reciting the Hail Mary three times in a row dates at least to the 12th century, and Saint Anthony of Padua (1195-1231) strongly recommended it. This devout practice was a great favorite also of Saint Mechtilde of Helfta (1241-1298) in her Revelations. 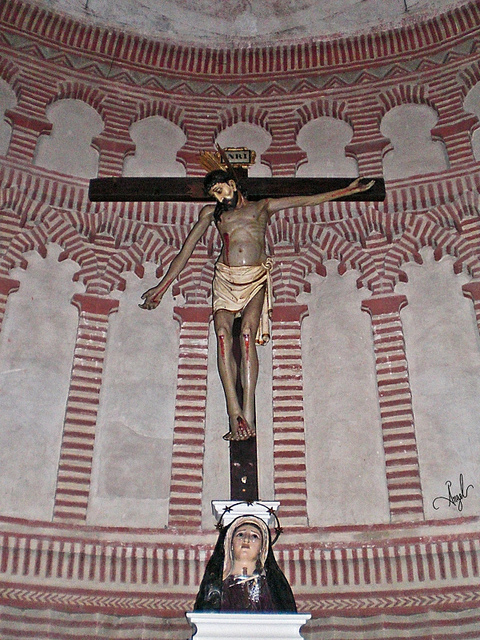 Saint Bonaventure, in a Chapter of the Order of the Friars Minor in 1269, proposed they recite three Hail Mary's in the evening after Compline, meditating on the mystery of Christ's Incarnation, urging at the same time that the recitation be preceded always by the ringing of a bell so that the brothers and all the faithful nearby would know that it was time for the triple Hail Mary. Shortly after the recital of the three Hail Mary’s at evening had become familiar, a custom established itself of ringing a bell in the morning and of saying the Ave thrice. It was the town bell which was rung in this case, for the preservation of peace, whence it was called "the peace bell." The same designation was also applied elsewhere to the evening bell. In a culture in which the activities of the Church and those of her children were intertwined, it seems probable enough that this morning bell was also an imitation of the monastic triple peal for the morning prayers. The morning Angelus soon became a familiar custom in all the countries of Europe and was almost as generally observed as that of the evening. In most Franciscan and contemplative monasteries, the Angelus continues to be prayed three times a day. In the United States and Canada, some Catholic radio stations run by laity broadcast the Angelus daily. In Ireland, the Angelus is currently broadcast every night at 6:00 pm on the main national TV channel, RTÉ One, and on the broadcaster's sister radio station, Radio 1, at noon and 6:00 pm. RTÉ Audience Research finds that a clear majority of Irish viewers still favors keeping the Angelus broadcasts, chimes and all. Its appeal is summarized by one audience member as follows, "To the person of faith, it's a moment of grace; to the person without faith, it's a moment of peace. What's not to like?" In the Philippines, radio and television stations run by the Catholic Church and some religious orders broadcast the Angelus at 6:00 am, noon, and 6:00 pm. The devotion is also broadcast over the public address system at noon and 6:00 pm in some shopping malls, and in many Catholic educational institutions mostly at noon on schooldays (some only ring bells at 6:00 pm). Could there be a connection between these two countries continuing to honor the moment when “the Word became Flesh” and the fact that unborn children still find protection in the laws of both Ireland and the Philippines? 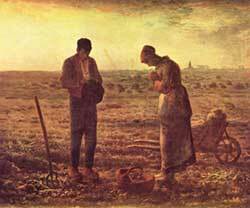 It is common practice that during the recital of the Angelus prayer, for the lines "And the Word was made flesh/And dwelt among us," those reciting the prayer bow or genuflect. Either of these actions draws attention to the moment of the Incarnation of Christ into human flesh. It is 3:00 on the afternoon of March twenty-fifth; it is a Friday. Taking on the appearance of a man, the Archangel Gabriel, whose name means Strength of God, leaves heaven for earth; he has a divine proposal to deliver—and a reply to receive. His destination? A certain little house on a quiet street in the tiny Galilean town of Nazareth, for there she lives, whose coming God has anticipated from all eternity. She has ravished the Heart of God with her love for Him and her humility before Him, and in her we find the only perfect source of consolation that God has reserved for Him-self on earth-the only perfect refuge of comfort He has allowed Himself. Having remained faultless of any offence against God—never by one thought, word or deed did she fail to measure up to the supreme and consummate perfection of a creature conformed to the Will of God—her purity and sinlessness is beyond utterance. Her vocation was so select and sublime and divine that He created her soul free from Original Sin, the sin of Adam. R. Be it done to me according to thy word.”—did God effect an event greater than that of the creation of the universe and the dawn of time. For within the womb of the Blessed Virgin Mary was conceived a God-Man—the Savior of the human race. Lo! Eternity and time have met, the Word has been made flesh! The Lord has become Our Lord—Jesus Christ. This holiest of names, Jesus, means Savior, Christ means the Anointed One; and now indeed the Redemption of the world is at hand. Oh, can we not feel the very trembling of the angels? It is the Incarnation that has finally come to pass! Although 2,017 years old, It is a Beauty ever new. Jesus said: “Abraham rejoiced that he might see My day;”—even the holy ones of the Old Law may now rest, satiated—”he saw it and was glad.” (John 8:56) Emmanuel—God—is with us, and He shall not be taken away.